January | 2013 | Goin' Mobile - Adventures of a Travelin' Music Junkie! ***And now for the most moving experience of them all, for me at least. It was the Lorraine Motel, where Martin Luther King, Jr. was assassinated on the balcony on April 4, 1968 before attending an event in Memphis. To see this hotel – which had been frozen in time – exactly how I remembered it from the news, movies, papers, etc, over the years was bonechilling. But, here it was in living color, for real, transported from the past, and right here in true form in the present! It was the Twilight Zone come to life – mindboggling and breath halting – to put it mildly! 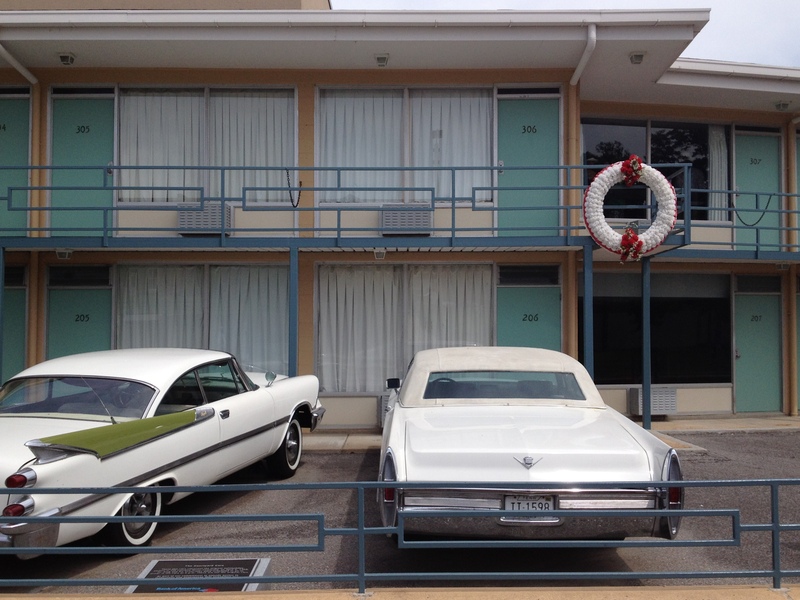 The Lorraine Motel has since been shut down and turned into the Civil Rights Museum. An attached building houses the history of slavery, racism, and the journey through the Civll Rights Movement. 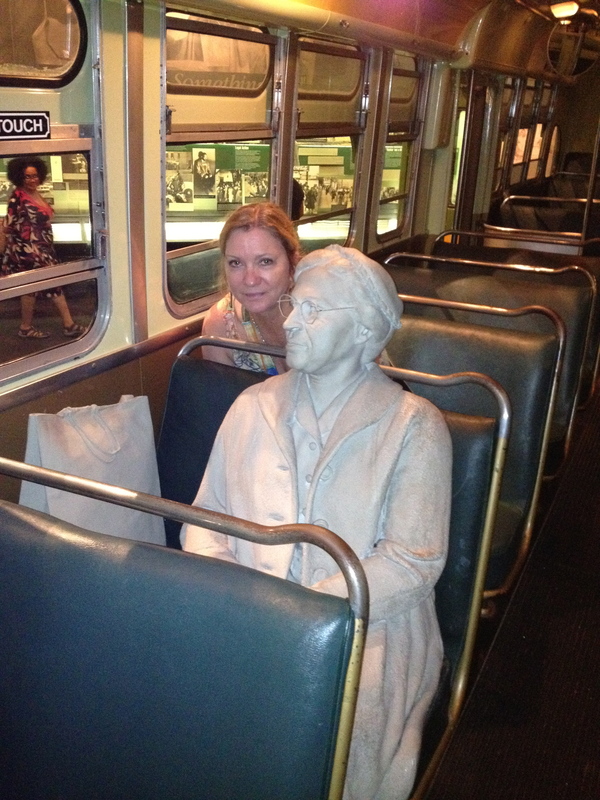 It takes you on an audio tour through two floors of the Movement, into a bus where Rosa Parks sits, shows Dr. King’s journey, then brings you to the room he had been staying in, and to the now infamous balcony where it all ended. To see the actual spot where this man took his last breath, violently and unnecessarily at the young age of 39, was beyond emotional. Though it had been forty-four years since that fateful night, it didn’t lessen the sadness of it all. What this man had accomplished in his short life only made me wonder what more he would’ve achieved had he lived. This unfair, unnecessary act of violence against such a decent and upstanding man can never be justified or forgotten. Downstairs, in the parking lot of the Lorraine, stood two cars that were replicas of those that Mr. King and his entourage were to drive to dinner that evening. Now called ‘The Courtyard Cars,’ they stand in remembrance of the night a dream ended. Across the street was the seedy flophouse where James Earl Ray had rented a room for the night, in order to play out his plan of killing Dr. King. This was another very moving sight, to see the room, the window, the bathtub he stood in, in order to have a good perch to aim from. It was all still there, set up the way it was that fateful night, and from the window we could see the balcony where Dr. King walked out, said his last words, and took his last breath. It was rather haunting to be in the very location, the actual spot, where this historic man was gunned down. I can hardly describe the emotion, as it was surreal and deeply saddening. To sum up my trip to Memphis, I can truly say that it was one of the most moving and educational places I’ve ever been to. The history, the culture, and the ghosts that still inhabit this fabulously, famously, richly eclectic party town make Memphis a diamond in the rough, a nugget of wealth and struggle, and a place where so much happened, from sharecroppers moving in to town from the fields, to the birth of blues and rock & roll. This is a town where blacks and whites came together in brotherhood because of their love for music. But, it is also the place where racism and hatred ran so deep that a beloved warrior for peace was murdered in the name of hatred. There is a lot of spirit in Memphis, as well as lots of spirits, of the spiritual kind. If you stop and listen for awhile, and allow yourself to feel the ghosts of music past, you will know they are still there, happy and content with the town that they helped put on the map. Happy that you are visiting their beloved town. Happy that the music lives on. And happy that their legacy continues to make others happy. Conversely, the deep scar that tarnishes this town, stands still in the memory of a man that stood strong for his beliefs. He will never be forgotten, and the Lorraine Motel may not be a happy place, but it is a place devoted and dedicated to keeping the history of Dr. Martin Luther King, Jr. alive and real.